Ground source heat pumps extract heat from below ground using pipes that are filled with a mixture of water and antifreeze. The ‘ground loop’ is buried in your garden where the temperature remains constant, even throughout the winter. The length of the loop depends on the available space and the amount of heat required. 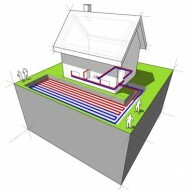 Ground source heat pumps with longer loops produce the most heat. if you are restricted by lack of room a vertical borehole can be drilled as an alternative. 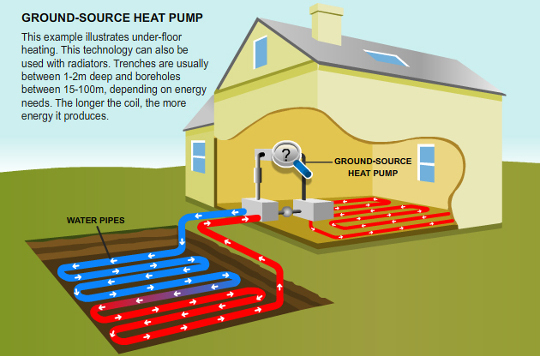 Ground source heat pumps work by extracting heat at low temperatures from below the ground and transfering it into a refrigerant fluid that is within a loop of pipe (ground loop). The fluid travels through a compressor that raises the temperature higher still and in turn the heat can be used for domestic heating and hot water requirements. The cooled fluid continues its cycle back round the loop collecting heat from the ground and bringing into your home. Ground source heat pumps work in a continuous cycle until heating is no longer needed. Save Money With Ground Source Heat Pumps! A typical ground source heat pump system will cost somewhere between £8500 and £17500. There are many variables to factor in when trying to work out the running costs, such as the size of the property and how well insulated it is. How much a ground source heat pump can save you will depend on the type of system you use and the system you are replacing. You may want to consider underfloor heating as it is more efficient than traditional radiators and so savings will be greater. 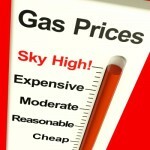 A ground source heat pump could lower your fuel bills, especially if replacing an electric system. It could provide you with an income via the governments RHI scheme. Provides heating and hot water. . Fit and forget technology means minimal maintenance.